I must admit sometimes this blog is for purely selfish reasons. I’m fascinated by the Vancouver real estate market. I’ve said it before and i’ll say it again, regardless of what happens this will be a case study in the next few years. Just when you think you know what’s going to happen next some reckless level of government hits the panic button and changes everything you thought you knew. Anyways, wild governments aside, here’s the good, the bad, and the downright ugly in early 2017. Of course depending on your stance and hopes for the market you might find the good bad, and the bad good. The market hasn’t gone to complete shreds. The entry level condo market is still chugging along. Whatever entry level is for your specific area. In Vancouver that’s the sub $600,000 market, in Richmond that’s the sub $400,000 market. These markets are still relatively “affordable” and thanks to Christy Clarks brilliant first time home buyers loan, it could keep pace. I was showing condos in Richmond this weekend in the $300,000 range, open houses were busy. Affordable Richmond condos are selling quick, some still going to multiple offers. 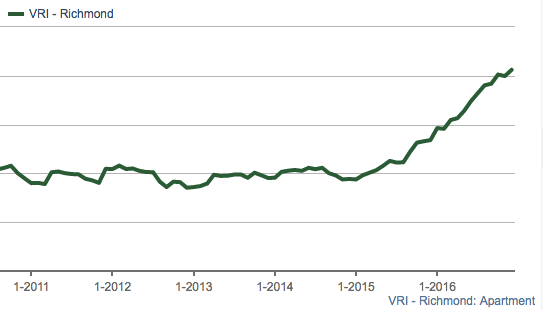 Most recent stats show Richmond condo prices are still climbing as of December. Inventory is still at record lows, however sales are tapering off and will likely fall by 15% or more this month, year over year. Will it be enough to offset the low inventory? MLS Benchmark for Richmond Condos hits new high in December 2016. The bad, Vancouver townhouses. Perhaps no surprise, as detached houses in the area become cheaper the incentive to pay almost a million dollars for a townhouse in Vancouver is beginning to make less sense. 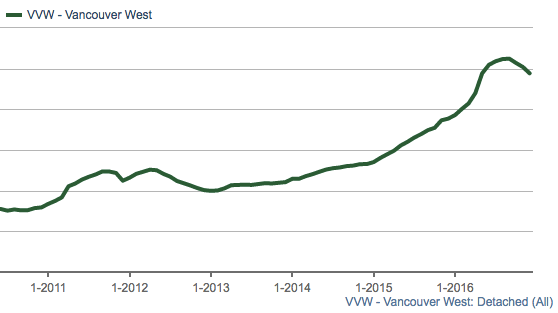 At the midway point of January there have only been a combined 5 sales in Vancouver East and West. For comparison, there were 22 sales in the same period last year. Should townhouse sales continue at this pace it will mark a 76% drop year over year. The drop off in sales is resulting in lower prices. See chart below of the most recent MLS benchmark price. MLS Benchmark price for Vancouver Townhouses. Vancouver West single family homes. Perhaps this comes as no surprise, since these homes are out of reach for 99% of locals, and have surged by 48% over the past 2 years. A price correction seemed impossible to avoid. Based on my conversations with prominent Realtors who focus on that product they tell me prices are down 20% from the peak. This is not reflected yet in the benchmark price. See chart below. Here’s where things get really interesting. Through the first 15 days of January, there have only been 8 sales. In comparison, January 2016 had 42 sales through 15 days, and the 10 year average is 33 sales. This marks a 76% drop below the 10 year average. 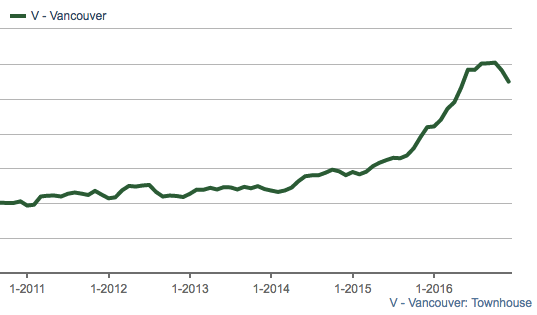 Here’s a historical look at total January sales for Vancouver West detached. So there you have it. The good, the bad, and the ugly. Some interesting things to track heading into the spring market.